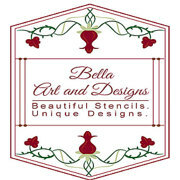 Bella Art and Designs sells stencils. The stencils are used for art and craft projects. People love making crafts and I have over 300 stencils...some of them my own designs. I have over 500 five star reviews between my Etsy and Ebay stores. The stencils vary in price from $7.00 for a single stencil to $24.50 for an X-large letter and number set. All my stencils are cut, packaged and shipped out by myself. I am looking for a business manager/investor who can promote my company's products and outsource production and marketing so that I can get my stencils sold in craft shops like Hobby Lobby and Michael's and Australian craft shops like Spotlight and Riot. I think they would really sell well in those stores.